March 28, 2006 | I find myself to be somewhat of a sushi enthusiast and as such was very excited to learn about the new Japanese cuisine restaurant Happy Sushi on 400 North across from the 7-Eleven. Happy Sushi opened its doors Friday, and by the next day I was sitting at one of its beautiful dark wood tables ordering spicy tuna and salmon rolls. My husband ordered Oyako Donburi (chicken and vegetables over steamed rice and miso soup) while the sushi men (preferred over sushi chefs) made cute faces at my baby. The décor is elegant for a restaurant that seats six at the bar and 31 at various Japanese-style tables. Accent lights are hung from wire across the ceiling and the walls have paintings of bamboo on them. 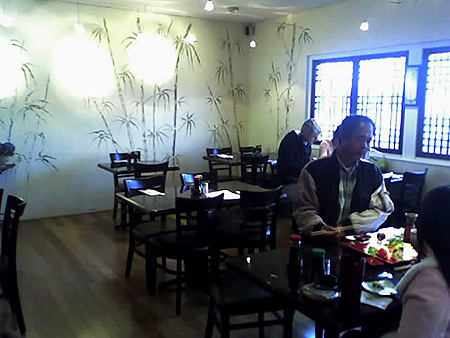 The sushi bar is manned by two sushi men, Byonhgo Lee, the owner, and Duongoo Lee. The two are not related. Manager Patricia Pedraza met Byonhgo in Salt Lake City when she worked with him at a clothing store he owned. Pedraza said Byonhgo had the idea to move to Logan and start a sushi restaurant because its market was lacking. While in Salt Lake City, Byonhgo learned the art of sushi and has been practicing for two years. Duongoo, the head sushi man, learned the art of sushi in California and has been practicing for nine years. After being served miso soup, my rolls arrived before my husband's food. He told me not to wait for him and I eagerly dived in. There are certain guidelines by which to grade Japanese cuisine and more specifically the sushi rolls. The presentation is very important (www.japanese-food-for-health.com) as well as the texture of the rice, freshness of the fish, and color of the ginger. It's not inappropriate to shove a whole piece in your mouth rather than try to bite it in half, so this is exactly what I did. With each delightful piece I noticed the soft and sticky rice, the perfectly fresh fish and the beautiful presentation I was slowly dismantling. My husband and I had the opportunity to eat at Iron Chef Morimoto's restaurant in Philadelphia and my husband immediately put Happy Sushi at Morimoto's level. I wouldn't quite put them that high but they're definitely up there. Pedraza said she and the others at the restaurant are not concerned about competition with Tanpopo. In fact it's not something they've really thought about, she said. Pedraza said she is not worried about Tanpopo's Happy Hour because Happy Sushi has a tendency to give out free samples during meals, which she believes will keep people coming back. According to the sushi men at Happy Sushi, the difference between a sushi roll and nigiri is the rice. Sushi really means rice with vinegar and a sushi roll has rice whereas nigiri does not. Sashimi is different because it is made only with raw meat and the meat is placed on top of the roll. Happy Sushi has a large menu separated into lunch and dinner with a separate sushi menu. The menu allows you to choose specials, combos, a la carte, appetizers and even salads and desserts. Happy Sushi has lunch hours Monday through Friday from 11 to 2:30 p.m. and Saturdays from noon to 2:30 p.m. Dinner is Monday through Thursday from 5 to 9:30 p.m., Fridays and Saturdays from 5 to 10 p.m. and Sundays from 4 to 9 p.m.
With such a friendly atmosphere and tasty food, I had a wonderful dining experience at Happy Sushi and will certainly return.